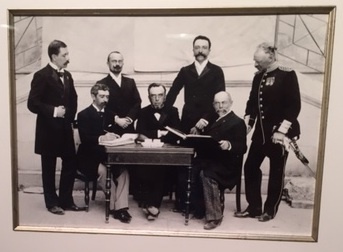 The first International Olympic Committee. I’ve blogged on topics related to Portugal’s culture and tourism for years, and apparently word has gotten around because two months ago the Consulate General of Greece in New York wanted my contact information to notify me of their events. Shortly afterward, I received an invitation to the opening of “Olympic Games — The Photographic Album of Albert Meyer,” 25 photos that were touring the United States before returning to the Benaki Museum in Athens. 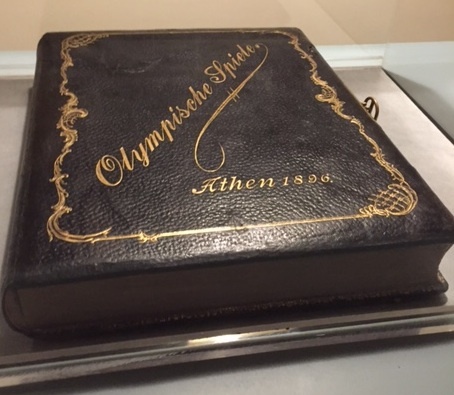 The 1896 Games in Athens were the first modern Olympics, held in the place where the Games started but this time (and through the present-day) an international competition that symbolizes peace through sport. Five internationally renowned photographers served as official photographers of the event, among them Germany’s Albert Meyer. Meyer took 25 black-and-white photos that featured the Olympic Committee, the athletes, the competitions, and the ceremonies. He created an album that was given to various dignitaries, but he kept the original photos in his studio in Dresden. Meyer died in 1925, and in 1943 his studio was bombed and destroyed. These 25 original photos miraculously survived and are now part of the Benaki Museum collection, rare and cherished documents of the Olympic Games’ revival and of international sport at the turn of the 20th century. As a writer of historical fiction, I appreciated seeing these photos. Our faithful representation of the past relies on knowing the hairstyles, clothing, objects, and pastimes of a given period. Photos and paintings are important sources for research. In Rogue I describe BMX bikers, their equipment and stunts. 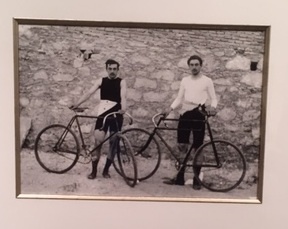 Were I to do the same for bicycling in the early 20th century, Meyers’s photo of the Olympic competitors next to their bicycles would help me, though I’d also need to be aware of the fact that equipment used in elite competition might take its time getting to the general population. Athletes’ competition (left) and ceremonial clothing. The opening attracted a large attendance that packed the Upper East Side townhouse. Everyone, except a couple of photographers and me, were Greek or of Greek heritage. The presentations were in Greek and English, and most of those in attendance spoke Greek to each other. New York City has a large population with roots in Greece, much of it centered in the Astoria neighborhood of Queens, though there’s a large Orthodox church in Midtown Manhattan. In his thoughtful address to the crowd, former Minister of Culture & Tourism Mr. Pavols Yeroulanos praised the close ties of this community to Greece and called for a renewal of those ties among the younger generation. He hoped that exhibits like this one would show Greece as more than its ancient empire or a country in the news only when it has an economic crisis. With deep ties in the past, Greece has a living culture, unique in its role as a link between East and West. 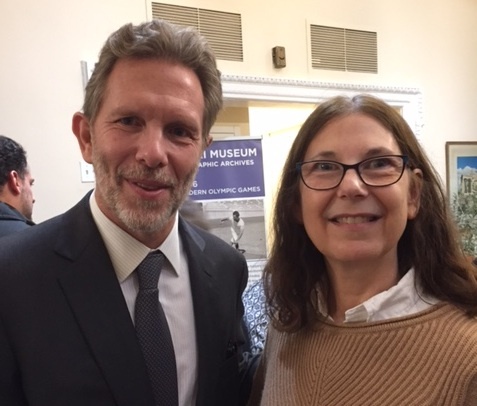 He urged the attendees to visit Greece and to support its cultural renewal, including the Benaki Museum, which collects art from ancient times through the Middle Ages and to the present day. With former Minister of Culture & Tourism, Mr. Pavlos Yeroulanos. After hearing the presentations and seeing the photos, I spoke with Mr. Yeroulanos and with a young woman who expressed her admiration for his words. The woman, Hyacinth, told me that she attended Greek school once a week growing up but worried that families today were not sending their children as much because of the cost and time constraint with other extracurricular activities. Her concerns sounded familiar to me, because our Reform Jewish congregation in Schenectady, where I taught for 16 years before moving to New York City, faced the same challenges. I do remember one of my daughter’s friends in elementary and middle school who attended Greek school just as Maddy attended religious school. One summer, Maddy accompanied this friend on a two-week trip to Greece, making her the only one in our immediate family who has visited so far. 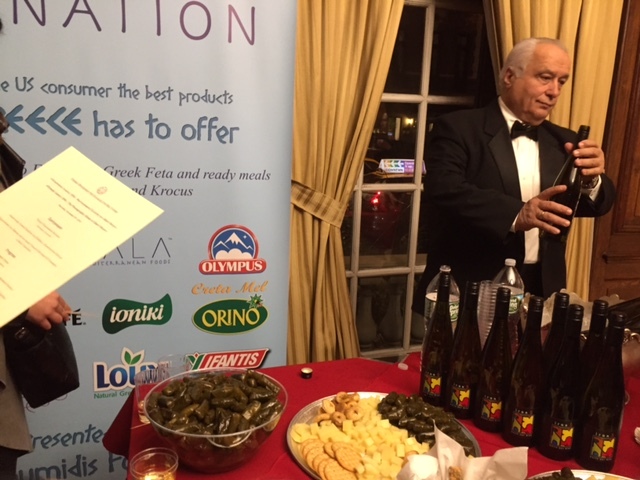 A lovely selection of Greek food and wine. Richard and I are adding Greece to our travel list. We’re planning to spend more time in Portugal in the future, which makes all the European countries more accessible to us. And when we go, the Benaki Museum will definitely be on our itinerary. In the meantime, I’m looking forward to more activities in New York City and getting to know this vibrant and dedicated community.